China and Japan will account for 71% of the region’s total revenues by 2024. China will command a 57% share by 2024 from the 22 countries covered in the report. Advertising on OTT sites [AVOD] is the main source of OTT revenues. SVOD will take 39% of OTT revenues by 2024, with AVOD supplying 52%. AVOD revenues will exceed SVOD revenues in China, India and Japan. China’s AVOD revenues will reach a staggering $16.60 billion by 2024 – or two-thirds of the Asia Pacific total. 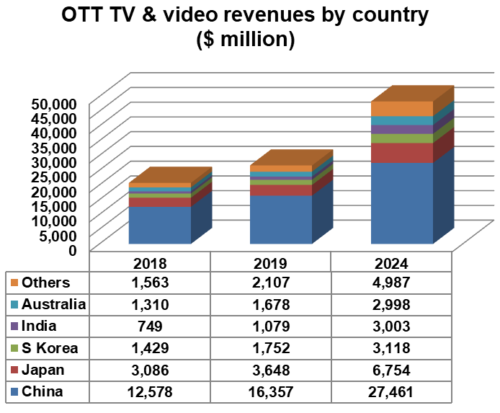 Asia Pacific SVOD revenues will climb from just under $8 billion in 2018 to $19 billion in 2024. China’s share will remain at about half of the total. India’s SVOD revenues will quadruple, but it will still be way behind the similarly-sized China. Three Chinese companies will top the Asia Pacific SVOD rankings by subscribers in 2024 – two of which will have more than 100 million subs. Never expected to operate as standalone platforms in China, Netflix and Amazon Prime Video will take fourth and fifth places respectively. Despite being fourth in the subscribers’ ranking, Netflix will top the SVOD revenues’ chart in 2024 – but only just! The top three platforms will account for 60% of the region’s $19 billion SVOD revenues by 2024.